As one of America’s most trust mini-van options, as well as a favorite around Middletown and Mechanicstown, the Odyssey not only helped to rejuvenate its class, but also continues to lead it. Why? The current 2014 Honda Odyssey not only delivers excellent performance, but also has a strong, demonstrated safety record. So how does the Odyssey compare to models like the 2014 Nissan Quest? 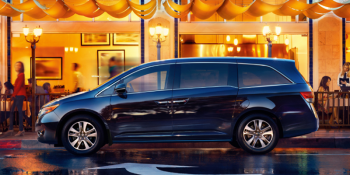 While both vehicles may be out to voyage, the Odyssey takes families there in signature style and comfort that’s tough to beat. The 2014 Odyssey comes equipped with a 248 hp V6 engine with a torque rating of 250 lb-ft. This is compared with the Quest with a torque rating of 240 lb-ft. 2014 Honda Odyssey drivers benefit from a higher highway fuel economy than Quest drivers, an estimated 28 mpg highway* versus 25 mpg. Another advantage is the longer list of standard options afforded to Odyssey drivers. Here are just a few of the features that come on the 2014 Odyssey that are non-standard on the 2014 Quest. A family has big moving needs and most drivers will want to get all the space they can. The Odyssey has a cargo volume of 38.4 cubic-feet behind the third row with a total capacity of 148.5 cubic feet with all the seats down. The Quest only has a capacity of 25.7 cubic feet behind the third row and 108.4 cubic feet total. There’s a lot more about the Odyssey that we just can’t convey online. The best way to see why the Odyssey remains so popular is to take it out for a test drive. Visit us at Middletown Honda, at 520 Route 211. We continue to remain one of the area’s top dealerships thanks to a lasting dedication to honest, personalized customer service and fair prices. If you have any prices, please give us a call!